Hey, my name is Aaron Miller, I’m the Visual Effects Artist on Abandon Ship, I work with Alex and Adam to create some of the crazy graphical things that happen in the game. I’m also the composer on the project, so I’m writing the music for the game too. This is the machine that started my life long affair with games – Funny how the little things shape your life in such a huge way! I’ve been in the games industry since 2005, but for me games and music go back a long, long way. 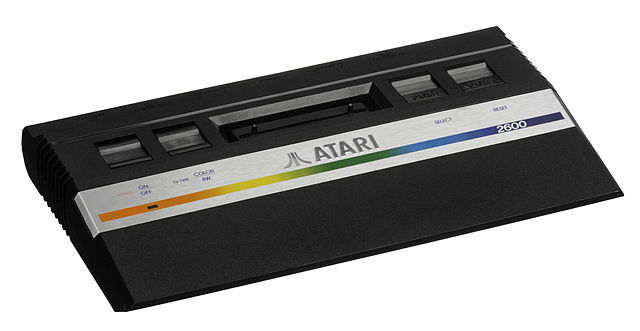 I started out with the Atari 2600 in the early 80’s, which my brother and I got between us for Christmas. God knows how our parents could afford such an insanely new and advanced machine back in those days! Each year we seemed to progress onto the next new machine; I think my dad was into it way more than he let on. 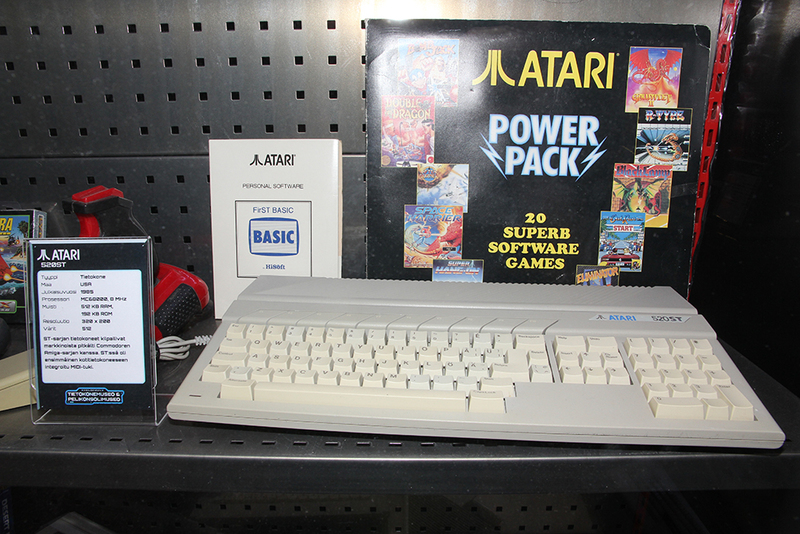 The Atari 600XL and Commodore 64 came along and blew our minds when we were kids, the Commodore 64 in particular. We were both die hard Commodore users back then, and used to recoil in horror at the mention of bitter rivals the Spectrum! Those who are old enough know that you were either one or the other! I loved my 520, I had many years writing music with it, as well as some classic games! My first games console since the Atari! Eventually I had started to move away from games and got into the realm of writing music on PC. I was certain that was where my path lay, and from that moment on I was focused on music. I spent many years in bands and came close to that big break a few times, but never quite got to the final step. 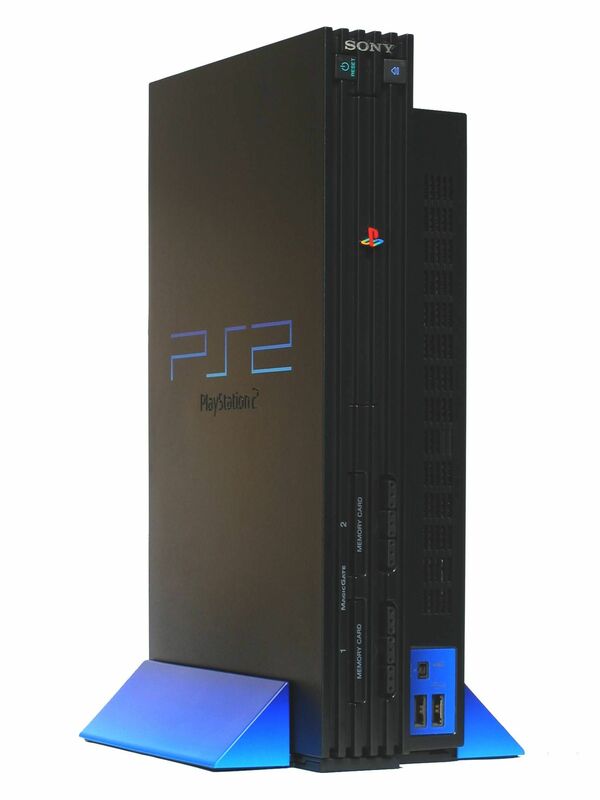 It wasn’t until the PS2 came out that I got back into games. I skipped all the Nintendo and Sega systems; even the PS1. I was still playing games on my PC, but back then the games were very different from their console cousins. PC had the added bonus of multi-tasking, so I could both compose music whilst dabbling in games. After spending years doing the rock-star thing, and countless people telling me “You’ll never make a living from music” and “Why don’t you get a real job”, plus the bands I was in just not working out, those seeds of doubt started to take their toll. I started to look at other options. So off to University I went at 27 (2002), and got my Degree in 3D Animation. I was recommended by my University Course Leader to Climax Studios and I got a job there back in 2005 doing Visual Effects for games. At the time I had never heard of VFX for games before! 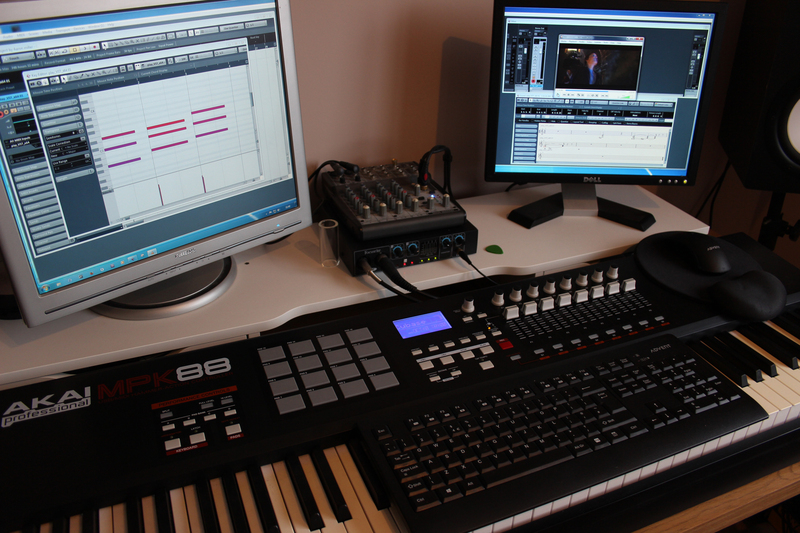 My Music Workstation, or DAW(Digital Audio Workstation), as they are usually known. 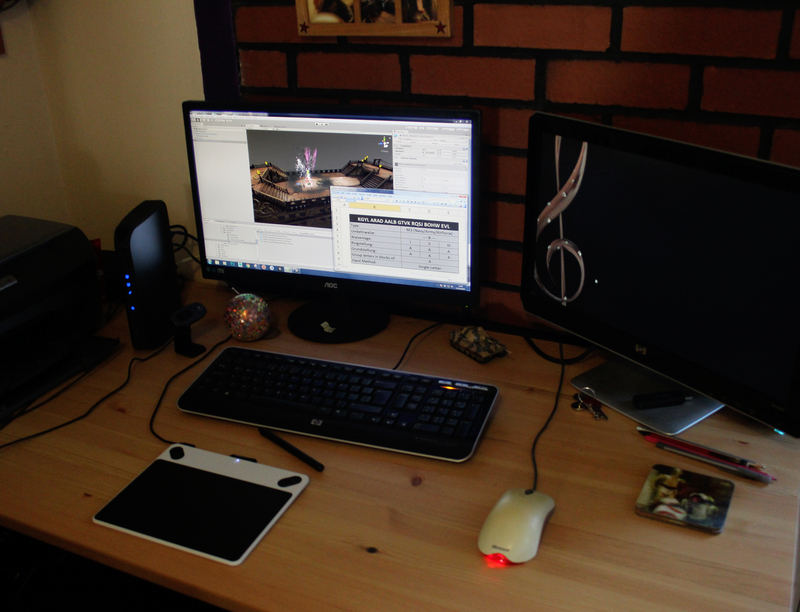 I have a dedicated Music PC and a VFX PC, which is why I have two images of my desk! I’ve worked on a whole bunch of games and demos in that time, 11 years on and I’ve been lucky enough to work on two Silent Hill games, and an Assassin’s Creed. I have specialised in Games VFX for over a decade now, having to know game engines inside-out is a crucial part of the job, and that’s before getting to any artwork or dynamics! My background means I am able to troubleshoot technical problems well. I also wrote the complete score for Bloodforge (an XBLA game), and I composed music for the Assassin’s Creed Chronicles games which included all the main themes. The India main theme is a piece I’m particularly proud of! I’m still writing music for my own personal projects, and I also write music for adverts, short films, and anything else that comes my way that I think sounds like a cool thing to try out. I also believe my experience as a VFX artist gives me a totally unique insight that helps compose music for games. I think that’s it for me right now; there’s a whole other lifetime of musical adventures that I could talk about, but this would go on forever! One day I would love to write an epic Meshuggah inspired soundtrack to a game. That would be awesome! My VFX workstation, where I like to blow things up!!! A Commodore man! My introduction to computers and gaming was similar. The C64 with a 1541 disk drive to an Amiga 1000 then an Amiga 4000 and finally a move to the PC. What game producers could do with 64K was simply amazing and the sound and color and interface was 10 years ahead of everyone else. I miss those days. Sign me up I’m ready to Captian my ship.